SpeedSport Promotions : Speedsport Drivers continue to impress! Speedsport Drivers continue to impress! 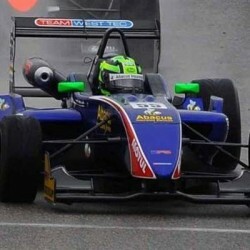 Speedsport drivers Callum Macleod and Stefan Hodgetts continue to have strong seasons. Callum,competing in the European F3 Open for Speedsport/west-tec took a 2nd and 3rd place finish at the latest round at Brands Hatch. This leaves Macleod in a strong 2nd place in the championship and all to play for with just 6 points on drop scores being the difference between Callum and championship leader Marco Barba and 3 rounds (6 races) remaining. Stefan has continued his superb form in the Trofeo Fiat Arbarth 500 championship taking a dominant double victory at Brands Hatch. Having missed 2 rounds Stef has a very hard task to win the title, however, he is in outstanding form and continues to real in championship leader Ben Winrow.